One of the UK's leading house builders has moved home in Exeter in search of more space, after two successful years of construction activity in the South West. Bovis Homes has enjoyed a busy time since re-starting its operations in the area in 2013, and has now moved its HQ to Heron Road, Sowton Industrial Estate, to accommodate its growing work force. The move is a sign of the times for the company's South West region, who started up with just six people based in their original offices in Camberwell House at the Exeter Business Park. They currently employ around 150 people, including a number of apprentices out on site at some of the 20-plus locations around the South West - including major new developments at Cranbrook and Sherford. 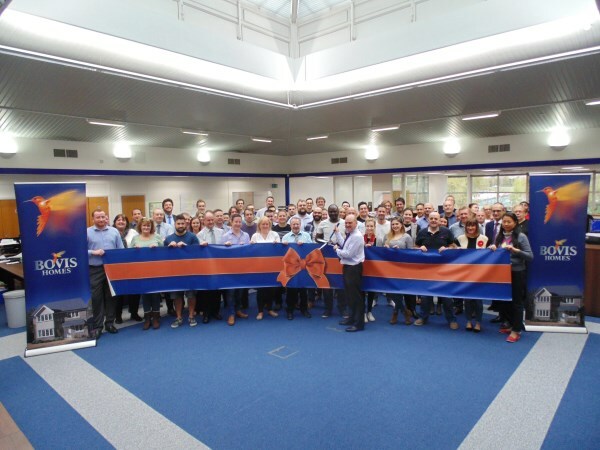 "These are exciting and historic times for Bovis Homes' South West region, and our move to these new larger offices is a sign of our long-term commitment to the area," said regional Managing Director David Farley. "We're proud to be delivering much-needed new homes for the people of the South West, as well as offering job opportunities and contributing to the economic regeneration of the area. "As a house builder we look to recruit people with a wide range of skills - from land buying to design to sales - and we have certainly been able to gather a talented, committed team since we reopened our South West operations." By retaining and developing its base in the heart of the region in Exeter, Bovis Homes are ensuring it can make the most of land opportunities that arise and can support its site teams based across Devon, Cornwall, Somerset, Bristol and Bath. "We're all about creating communities, and many of our people live and work in the areas where we operate, so we know the region well at a number of levels," said David. "The future is looking bright here in the South West and we are delighted to be playing a part in it." For more information about Bovis Homes developments in the area, visit www.bovishomes.co.uk.